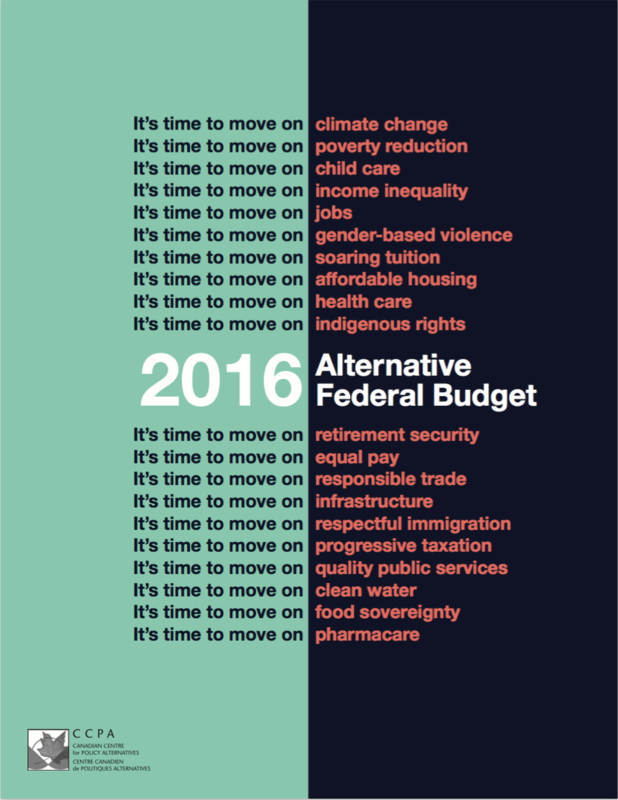 The Alternative Federal Budget 2016: Time To Move On proves that we can fight climate change and create jobs at the same time, that we can reduce poverty and grow the economy responsibly, and that there is more than enough fiscal room to ensure that everyone can have a better future. We shouldn't let the idea of federal deficits, even relatively large ones, scare us off making much needed investments in Canada—well structured spending more than makes up for any additional debt through a stronger economy. This year's AFB delivers a plan that would lift 1.1 million Canadians out of poverty, reduce income inequality, boost economic growth, and, at its peak, result in 520,000 new jobs, bringing Canada’s unemployment rate to 6.0%. It's time to move on the issues that matter. Click to share our infographics. 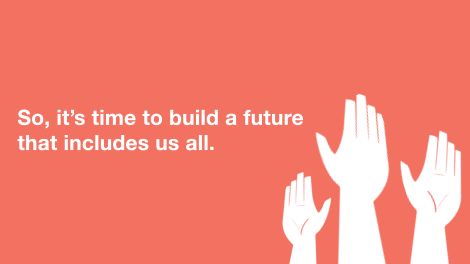 Let's build a future that includes us all. Click above to watch our video. 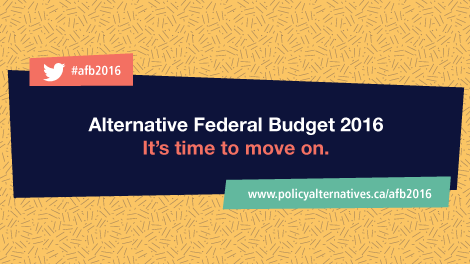 Click above to download the full 158-page Alternative Federal Budget 2016. Cliquez ci-dessus pour télécharger la version française de l'ABGF 2016. 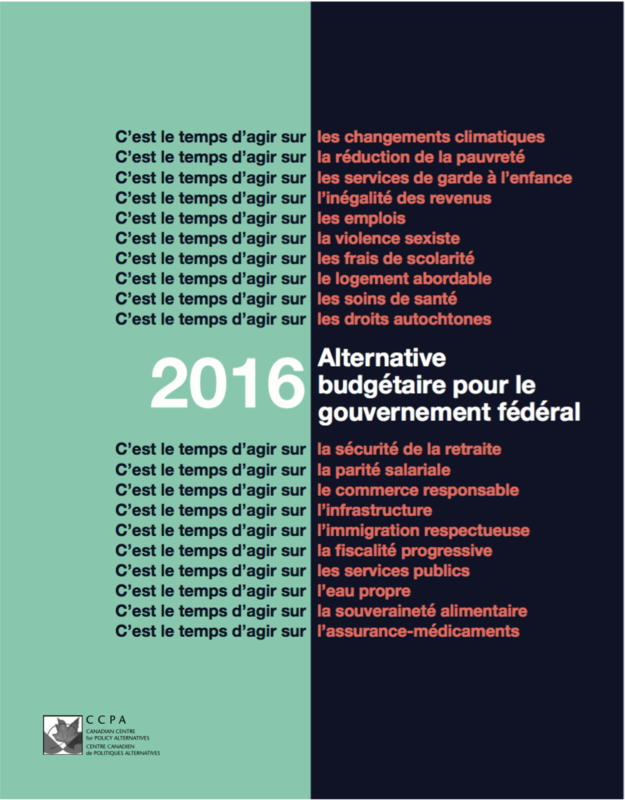 OTTAWA—The 2016 Alternative Federal Budget (AFB), released today by the Canadian Centre for Policy Alternatives (CCPA), projects a federal deficit of $29.2 billion for 2016-17 when Liberal platform measures are taken into account. It also delivers a blueprint showing how the government could take on a $37.9 billion deficit and still maintain Canada’s debt-to-GDP ratio.